Tallahassee, FL—The name and character of former Florida State University graduate, twenty-three-year-old, Rachel Hoffman, was “Assassinated” after her lifeless body was found in the woods in another county, fifty miles outside of Leon County in May 2008. As many may remember, Ms. Hoffman was abducted during a botched drug sting operation. According to reports, Ms. Hoffman, who had previously been arrested for possession of marijuana and sentenced to drug court, was recruited by police to participate in a drug sting that involved a gun, pills, and a large sum of cash. It’s been said that Ms. Hoffman’s fear of being sentenced to serve time in jail and/or prison, was why she had agreed to participate in the drug sting. Ms. Hoffman had not been trained at all to be a drug informant. The decision that police officers made to not train Ms. Hoffman to be used as a drug informant, may have been what caused her to be kidnapped and murdered execution style by one of the men during the drug sting. The police lost track of Ms. Hoffman during the drug sting operation. Second Judicial State Attorney Willie Meggs was interviewed by Dateline Investigative Reporter, Chris Hansen about Rachel Hoffman’s murder and the negligence of the Tallahassee Police Department. Despite the officers having been found to have committed numerous policy violations, no charges were brought against any of the officers involved. Rachel Hoffman may have lost her life due to her fears of serving jail and/or prison time for marijuana possession in Leon County. In January 2015, Governor Rick Scott appointed Mike Wood as Leon County Sheriff, after the death of Leon County’s longtime serving sheriff–Leon County Sheriff Larry Campbell passed away. Mike Wood, a lifelong resident of Tallahassee who had been employed with the Leon County Sheriff’s Office for decades, had been previously arrested for possession of marijuana. If Mike Wood was the best ‘Uniformed Leon County Sheriff’s Deputy’ to replace Larry Campbell, then why is it that children and college students in Tallahassee are being stalked and harassed by law enforcement officers? Rachel Hoffman lost her life in a cold-blooded manner in part due to her possessing marijuana, while Mike Wood landed a job with the Leon County Sheriff’s Office only to be later appointed by Governor Rick Scott as Leon County Sheriff due to his prior possessing marijuana. Prior to the death of Leon County Sheriff Larry Campbell, there was an Ethics Complaint filed against Sheriff Larry Campbell for in part for providing his wealthy friend, Don Odham, with a law enforcement badge and allowing him to perform the tasks of a law enforcement officer– to include the responsibilities of a Leon County Sheriff’s Detective with the Violent Crimes Unit, a Crime Scene Detective, an Interrogator, and a Lead Detective on at least one double homicide case. In most cases, Don Odham, replaced veteran full-time detectives who worked vigorously to obtain and maintain the necessary credentials to work as a certified law enforcement officer in the state of Florida. Don Odham also assigned a patrol car of his own to take home—to use at his leisure. The Ethics Complaint was quickly dismissed. In 2013, there were several complaints filed against Leon County Sheriff’s Deputies for perjury and smuggling contraband into the Leon County Jail. The video evidence that supports the complaints and the complaints themselves have been ignored. Both Governor Rick Scott and Attorney General Pam Bondi have long been abreast to the dangers of the operations and the lack of creditability of those law enforcement officers in Leon County, but instead of addressing those dangers appropriately—Governor Rick Scott chose to add to them—i.e. Sheriff Mike Wood, the sheriff with a criminal past. State Attorney Willie Meggs’ office has provided money to criminals, his office has manipulated pay codes to allow certain indigent defense attorneys to be assigned cases that would favor the state convictions, his office has filed documents that falsely identified law enforcement personnel (again to favor the state’s case). Under State Attorney Willie Meggs’, Tallahassee and the surrounding counties that he serves, are toxic wastelands. Citizens are not protected. Criminals are financially supported by judicial officials and law enforcement officers are well protected—regardless of their criminal acts. On January 28, 2011, the mother of seventeen-year-old, DeShon Thomas, who was a freshman at Tallahassee Community College, drove DeShon to the Leon County Sheriff’s Office and asked to speak with the lead detective investigating the January 27, 2011 double homicide case that occurred in the Wolf Creek subdivision. Law enforcement officers had been harassing DeShon. Despite DeShon’s mother invoking DeShon’s Miranda Rights, DeShon was taken away by Don Odham. DeShon was denied access to an attorney and to his mother. Meanwhile, the one-bedroom apartment of DeShon’s co-worker and friend, 21-year-old, Trentin Ross, who had allowed DeShon to temporarily sleep on the couch in the living room at his one-bedroom apartment, was being raided by the Leon County Sheriff’s Office with a search warrant for firearms. Though there were no firearms located, detectives did locate a small size marijuana grow in Mr. Ross’ bedroom closet. Reports stated that there were five pots of soil with stems sprouting from them. Instead of using “good ole fashioned police work” to solve the double murder case, Don Odham, the wealthy friend with a badge, who was going around presenting himself as “Leon County Sheriff’s Detective with the Violent Crimes Unit,” scared Mr. Ross into giving incriminating statements against DeShon. Mr. Ross, who did not have any prior arrests, feared being sentenced to jail and/or prison, went along with the plot against DeShon. The same as Rachel Hoffman, Mr. Ross was scared and desperate. Don Odham and Assistant State Attorney Jack Campbell, who by the way is the son of Leon County Sheriff Larry Campbell, plotted together to have DeShon arrested, charged and convicted for the double homicide. 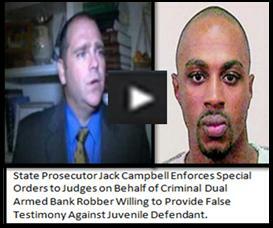 State Attorney Willie Meggs and Assistant State Attorney Jack Campbell have violated many laws to protect their criminal acts against young, naïve children. Tallahassee’s drug problem was not a problem for Leon County Sheriff Mike Wood.